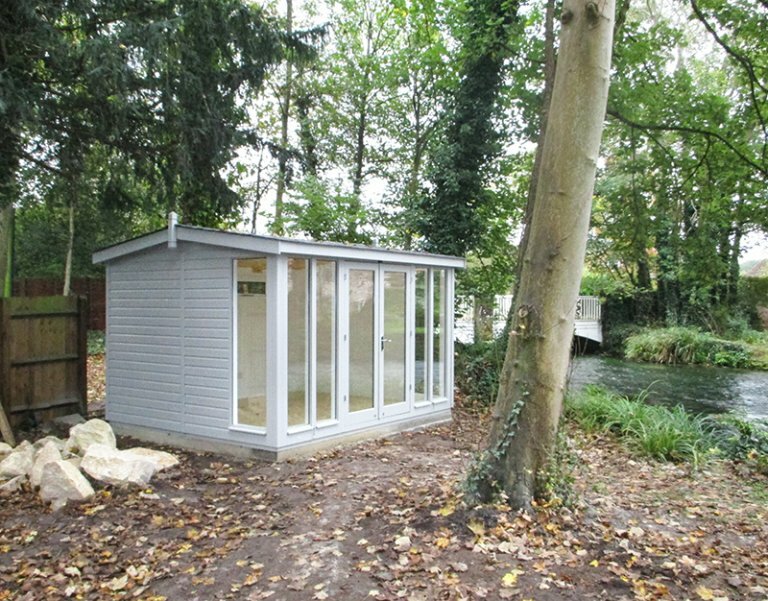 This size Burnham Studio usually stands at 2.8m high, so in order to comply with local planning laws, the customer requested to have the eave height restricted to 2.1m, making the total height of the building 2.45m, and allowing the customer to avoid having to apply for planning permission. As well as the double doors and 6 full-length windows, 2 opening fanlight windows were added to the rear of the building, allowing further air circulation for balmy summer days. 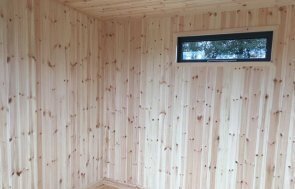 The studio is also fully insulated to ensure that the temperature is kept pleasant, and the building fully functional, all year round. The customer opted for painted matchboard lining and a natural lacquer floor which meant that the Burnham was ready for use from the moment it was installed, which it no doubt was! Chrome door furniture adds a modern yet timeless look and perfectly complements the shade of Valtti paint. An electrical pack was also added meaning our lovely customer can enjoy lighting and mains power, which not only extends the hours of use on the building, but also opens up many more opportunities of how to use it. 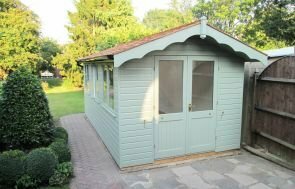 If you would like to browse our range of garden studios for yourself then please visit our website or perhaps even contact us for more information. 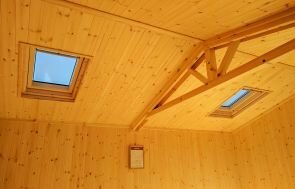 Alternatively, if you wish to see these beautiful buildings for yourself, why not visit one of our show centres based around the UK.